Galley Wench Tales: Unbelievable Serendipity! 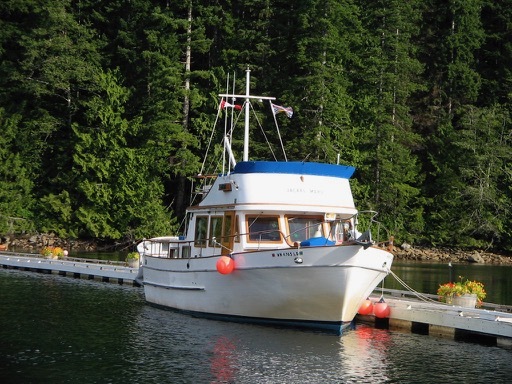 Puget Trawler "Jacari Maru" in British Columbia, owned by Larry and Nancy. Starboard aft view. Photo provided by Larry. Our cruising was done, for now, and it was time to settle down, as "dirt dwellers" in Portland Oregon. We mollified ourselves with visions of dishwashers amidst full kitchens, cushy recliners, a queen-sized bed, endless hot showers, easy-streaming wifi... basically, the life most of my friends, family and colleagues take for granted. Yet for most of the last 5 years, we gave up these mainstream modern conveniences in exchange for our nomadic life, ultimately traveling halfway around the world via a small sailboat. Our living space was about 150 square feet. We got rid of nearly everything when we left, except for a few boxes, mostly photographs. Yet Portland's giddy real estate market left us feeling a bit shell-shocked, with a month-to-month rental starting point of $1,500+/month for a 2-bedroom apartment in a crummy neighborhood. That's twice what it was when left the area in 2010. Pacific Northwest Cruising friends, Larry and Nancy. Photo provided by Larry. We met about 6 years ago when the fellow I crewed for some pre-cruising experience dropped anchor a bit near to the only other boat in "our" anchorage in British Columbia. The anchorage was particularly deep, with few spots shallow enough to for even somewhat ample anchor chain to comfortably reach. After much heated back-and-forth discussion between the two captains over the VHF radio, we reached anchoring detente; both boats stayed put. As is oft the case, we were on a similar cruising track, and the other boaters, Larry and Nancy on the Puget Trawler Jacari Maru, came by to break bread; initiating our friendship. In the several days that followed, we continued to meet. 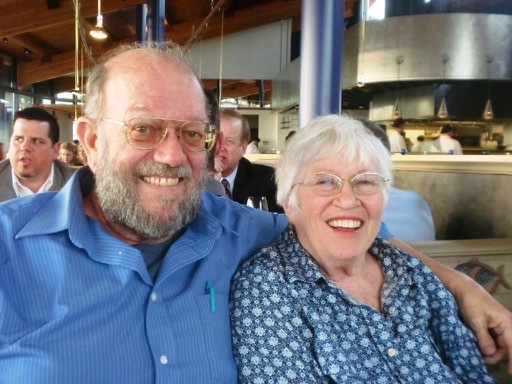 When I asked Larry and Nancy how they met, their long, entertaining answer spanned two days. They were very supportive of Wayne's and my plans to sail the South Pacific. They too planned some adventurous sailing, though enough years had passed they contented themselves with cruising the Pacific Northwest. 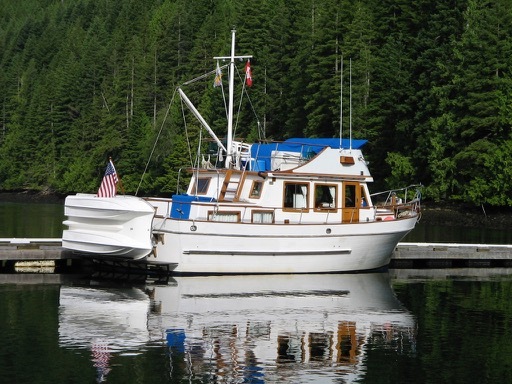 Recently, much as Larry and Nancy loved their 1978 40' Puget Trawler, they decided after 10 years of cruising Jacari Maru through the Pacific Northwest, and even into Alaska, it was time to downsize. They purchased an almost-new 2015 trailer-able 27' Ranger Tug. Meanwhile, the monthly La Conner marina (about a 4 hour drive North of Portland) and insurance payments for their now unused 40' Puget Trawler continued. 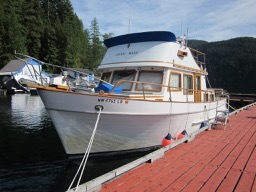 Puget Trawler "Jacari Maru" bow view in British Columbia, owned by Larry and Nancy. Photo provided by Larry. "Would you like our Puget Trawler as a live-aboard?" asked Larry. "We can sign the title over to you if you're interested." I was flabbergasted by the sheer generosity of their offer. So was Wayne. At the same time, we were keenly interested. At the same time, while one adage advises to "never look a gift horse in the mouth" another describes boats as "large holes to throw money into." Wayne and I looked into Portland marinas where live-aboards were allowed and were pleasantly surprised to discover there was ample slip availability. Covered slips with extra live-aboard fees would run a little over $600; far less than an unfurnished apartment and in a far safer neighborhood. Besides, unlike apartments, live-aboard boats do not need furniture; it's already all built in. We still needed to make sure the boat would work for us as a live-aboard if Wayne was working a swing-shift and I was aboard when he was trying to sleep. When we had a similar scenario aboard our sailboat Journey in Jacksonville, Florida. We were not at our finest. Every time I stepped aboard or tried to cook, I woke Wayne up. We needed to take a good look at Puget Trawler together, and assess its suitability for us. We hopped into the car we bought the day before to pick up a few items for our trip North, and discovered one of our car cylinders was shot. We limped the car back to Wayne's parent's place, who kindly loaned us their truck for the weekend. Of we went. Port view of Jacari Maru, Puget Trawler in British Columbia. Photo provided by Larry. Fortunately, the Puget Trawler had a very different layout from our former sailboat, an extra bedroom (cabin / stateroom), an extra bathroom (head) and easily 2-3 times the interior living space. Unlike Journey, where the entire boat living areas were all on the same level, the staterooms and bathrooms were all a half-level lower than the kitchen / living / dining room area. Not only were the staterooms nicely separated from the main living area, Wayne could at long last reclaim his "man cave!" Watch for interior photos in a future post. We decided to take Larry and Nancy up on their incredibly generous offer. We spent two nights aboard and did some preliminary provisioning. Larry spent hours walking us through the boat's particulars and followed up with many emails. Wayne and I made up lots of to-do lists and did some preliminary boat provisioning, including buying 2 knives, forks, spoons, bowls, and plates Goodwill while we had a vehicle by the boat. We plan to take the train up to the boat in a few days, to avoid the complications of having to retrieve the car later after bringing the boat back to Portland. Wayne and I contacted our insurance agent - coincidentally the same company that Larry used -- for a boat insurance quote. ""Do something big for the 4th of July," encouraged Walter, our agent. "Oh, wait a minute - you already are!" he added. We met again with Larry and Nancy and signed the title agreement. When the time comes for us to sell the boat, we'll give the proceeds less expenses to Larry and Nancy. It's only right. "Our new boat is Jacari Maru," Larry said. "We're keeping the name, so you're going to have to re-name the boat. I already even stripped the name off the Puget Trawler." With Journey, the prior owner named the boat, and we kept the name. Sure, we figured eventually we'd get a boat again. Never in our wildest dreams did we expect it to happen this soon or in this way. Given the nature of how the boat came to us, we've decided to re-name the boat Serendipity. Thank you Larry and Nancy for this incredible, unexpected and wonderful opportunity! Serendipity's current home. We'll relocate her to Portland Oregon soon. Image pilfered from La Conner Marina's website. At the moment, we're back in Portland Oregon wrapping up a few loose ends before we return to Serendipity in La Conner (N48.23.47 W122.29.48) this Thursday or Friday, July 6th or 7th. The plan is to get us and Serendipity ready as quickly as possible for a brief cruise in the stone's-throw-from-La Conner San Juans before bringing her down to Portland.